Many of these organizations funded by Donors Trust and Donors Capital Fund are also working to attack clean energy. Goldenberg notes in a companion article that recipients, including groups like the Heartland Institute and Americans for Prosperity (AFP), have received millions from the two secretive organizations. AFP, which received $7.6 million from Donors Trust and Donors Capital Fund in 2010 (43% of its budget), drove anti-wind efforts last fall, leading a coalition of fossil fuel-funded groups to write a letter calling on Congress to block tax credits for wind energy. The Washington Post reported in November 2012 that the Heartland Institute, which received $1.6 million from Donors Trust and Donors Capital Fund in 2010 (27% of its budget), joined with the American Legislative Exchange Council (ALEC) to push model legislation to state legislators in an effort to eliminate state clean energy standards across the country. In addition, organizations that are part of the State Policy Network (SPN), which received $4.8 million from Donors Trust in 2010 (36% of its budget), published reports bashing clean energy standards that are now likely being used to attack clean energy policies in states across the country (like Kansas and Ohio). 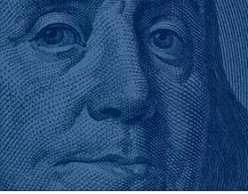 Furthermore, the Guardian revealed in a third story that Donors Trust bankrolled the Franklin Centre for Government and Public Integrity, a newly established organization founded in 2009, which is running a campaign to “stop state governments moving towards renewable energy.” The Franklin Centre has strong ties to American’s for Prosperity and the Koch Brothers, including former staff members of both AFP and a Koch Family Foundation according to a PR Watch investigation. Are these attacks ideological? Or are other fossil fuel interests like the Koch Brothers funding these efforts to stop a potential market threat? We know that fossil fuel corporations that have a financial incentive to stop the growth of the clean energy industry and their benefactors and foundations have funded many of these groups over the years. With an ability to hide the money trail through groups like Donors Trust, I would bet fossil fuel interests continue to fund fake grassroots campaigns and front groups to attack clean energy. 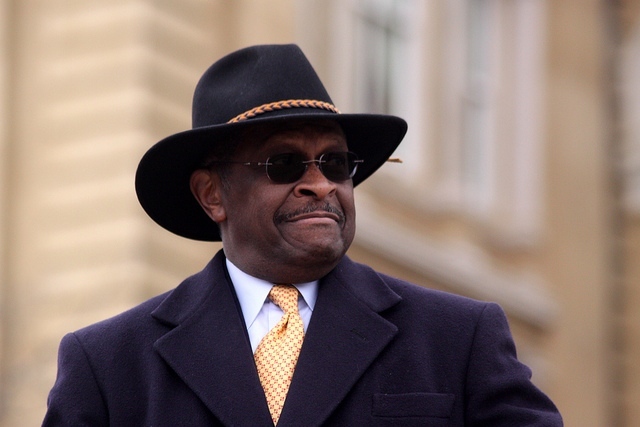 Herman Cain’s quick rise up the political latter is raising eyebrows in the energy community. On the campaign trail Cain loves touting his business background. He likes to cast himself as the ultimate outsider but his rise appears to be an inside job. Enter Charles and David Koch. Yes, the same Koch brothers who have been profiled by The New Yorker and 60 Minutes for working behind the scenes of the American political system to manipulate environmental policy for the betterment of their chemical companies. And yes, the same David and Charles Koch who recently came under fire for secret dealings with the Iranian government. These two men are also behind Herman Cain’s climbs in GOP and Cain isn’t even hiding it for one second. 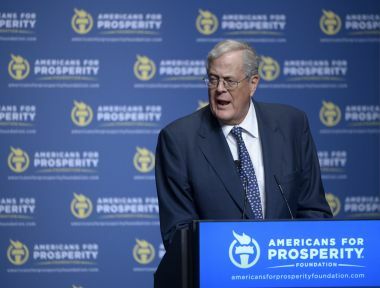 Last week, Americans for Prosperity (AFP) wrapped up their tour to push Big Oil’s agenda under the guise of more jobs and lower energy prices in an effort to weaken protections for our air, water, public lands and oceans. Ironically, it turns out that the AFP tour did help promote jobs … in China. 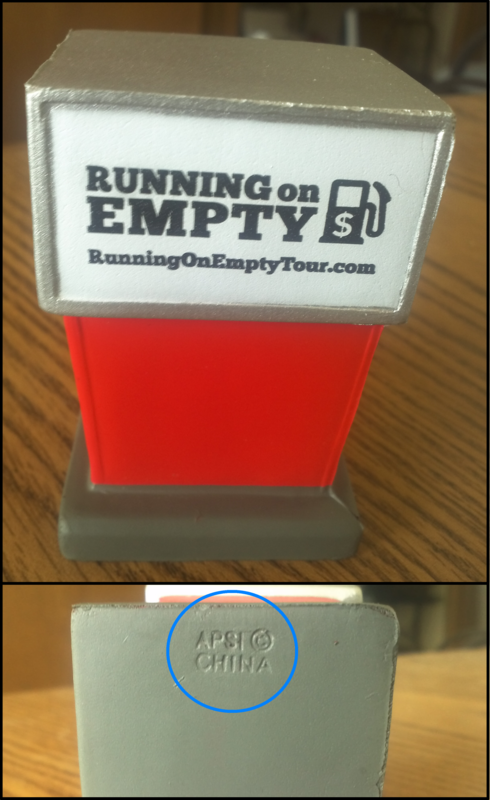 Part of the free giveaways to the few who actually showed up to the “Running on Empty” tour stops, included $20 gas cards to Diamond Shamrock and small foam gas station pumps. It turns out the toys were a made in China (see photo). Talk about a rookie campaign mistake. The gaffe says everything about what AFP is all about … lining the pockets of their funders like the oil refinery magnates the Koch Brothers and Big Oil companies like ExxonMobil, Shell and BP… while ignoring what is actually important to western states and American families. If AFP is going to be shilling for multinational oil companies and conservative political operatives, the least they could do is make sure the props are made in America. The props and gifts didn’t do much for turnout. Most of the events had less than 50 people and were accompanied by an equal or greater number of opposition voices (the notable exception being the conservative stronghold of Colorado Springs). And the $20 Diamond Shamrock gas cards seems like a paltry consolation prize to the $67.4 billion in profits oil and gas companies have made in the first half of 2011 thanks to the high prices Americans have been paying them at the pump. Even Diamond Shamrock’s parent company, Valero, continued its climb away from junk bond rating status with $744 million in Quarter 2 profits, a 28 percent increase over last year. The facts behind AFP’s tour were also a little thin. They blamed President Obama for a doubling in gas prices. The problem is that it’s just not true. The Denver Post’s political blogger, Lynn Bartels, pointed out that gas prices topped $4 per gallon under George Bush in May 2008. The Denver Post piece also covered ProgressNow’s counter effort which pointed to the tradeoff Republicans such as Reps. Doug Lamborn and Scott Tipton have asked Americans to make between funding Social Security and Medicare and Big Oil tax breaks. When it comes down to it, the “Running On Empty” tour is about more giveaways to oil and gas companies – only this time it is in the form of the air we breathe, the water we drink, and the treasured landscape of the West. Credit should be given where credit is deserved, however. Jeff Crank of AFP did tell Coloradans that he “couldn’t be more against subsidies to Big Oil companies.” (Video courtesy of Colorado Eyes on Congress.) It’s just too bad that they are spending their money from the Koch Brothers supporting the dismantling of air, water, and land protections instead of ending $15 billion a year in special tax breaks to Big Oil which they purport to support.